This page is particularly useful for developers and website designers who know what they are doing with HTML, PHP and SQL. If you are not conversant with the code on this page, please draw the attention of your developer to this page to properly integrate the OnlineNaira API into your website. If you would like OnlineNaira to help install this API into your website, please send us an email here. Client-side - allows you to manage shopping cart and button integrations; the part that is displayed to the user. The client side is used to send any information from your website to OnlneNaira using simple HTML form. Server-side or Call back, allows you to receive notifications about processed transactions from OnlineNaira to your website's backend that may help you automate your service deliveries.This part is sent to your website and is in PHP. PHP API - Client Side. member* OnlineNaira Username - this is one parameter that the user cannot change in OnlineNaira. Once set at signup, it remains the same throughout the life of the account. It is unique and it forms the most important identification for members. This parameter must be set for your integration to work. product Product Description - This could either be the Product Title in a few words or some unique code or some unique identification for the product. pid unique transaction identification or some number that uniquely identifies the event - this is optional. apikey this is currently optional, but some api calls will require your api key. Generate api key here. country This is an optional local currency setting. Use ISO. OnlineNaira will assume NGN if left blank - Ghana - GHS South Africa - ZAR Benin - XOF Burkina Faso - XOF Burundi - BIF Cameroon - XAF Cape Verde - CVE Centrafrique - XAF Chad - XAF Congo - CDF Cote d'Ivoire - XOF DR Congo - CDF Equatorial Guinea - XAF France - EUR Gabon - XAF Guinea Bissau - XOF Guinea Conakry - GNF Kenya - KES Liberia - LRD Malawi - MWK Mali - XOF Niger - XOF Rwanda - RWF São Tomé and Príncipe - STD Senegal - XOF Sierra Leone - SLL Tanzania - TZS The Gambia - GMD Togo - XOF UAE - AED Uganda - UGX United Kingdom - GBP Zambia - ZMW Zimbabwe - ZWL If the currency you need is not lists, please get in touch with us and we would consider adding it. comments This could be extra product description or notes from the buyer. ucancel This is the url to return the buyer if the payment is unsuccessful. unotify This is the url to your website where some payment script or ipn is handled. OnlineNaira will send you an automated email notification after every successful payment, but if you want to have a deeper integration with OnlineNaira, the unotify must be set to a url that will handle call-back parameters. * these parameters are mandatory. Notes - All payments in OnlineNaira are in Naira (NGN), but you should display your local currency in your shop while setting the country parameter to the 3 digit ISO code (ISO-4217 ) before parsing to OnlineNaira. PHP API - Server Side. action This is the type of transaction and it can only be either product, donation, subscription or payment. buyer This is the OnlineNaira Username of the buyer. total This is the total amount paid to your OnlineNaira account. 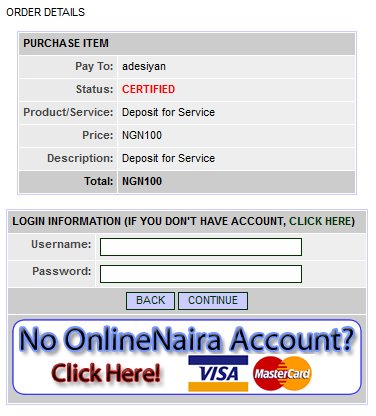 rtsend OnlineNaira's updated exchange rate from NGN to $ usable for this transaction. quantity This is the quantity of product, if applicable. comments This will provide any comments/notes added by the buyer. Click here to generate API key to use in your installation. Remember you will need to login to create an API key. Here's an example of the api implementation if you are looking to receive deposits on your website. If you prefer to collect money with OnlineNaira in other currencies, pls be sure to set the country parameter. We have provided some buttons below for your use, but you should be able to use just any button that matches the design of your wif you are looking to website. We have provided all our eCurrency rates in API so you could automate their use in your applications. The rates are updated every 15mins. If you would like to update the rates now, click here. This is the rate we will use if you use our pay4me service. The rates are updated every 15mins. This offers you the status of any OnlineNaira user provided you have a username. This can come in handy for a number of reasons including checking if a user exists on the OnlineNaira system and to know if they are UNVERIFIED, VERIFIED or CERTIFIED. See certification information here to see how best to use this API parameter in your applications. For instance, you may want to offer your service or a premium service level to CERTIFIED OnlineNaira members only. If you have a need to print all transactions with a user, these are the API parameters to use. - date-to(string - yyyy-mm-dd) e.g "2019-01-16"
This parameter tells you the status of any OnlineNaira user provided you have a username. It confirms the user exists and whether they have a balance greater or less than zero. WooCommerce - click to download module. PremiumPress - click to download module. Magento - click to download module. Cubecart - click to download module. If you are looking to test the OnlineNaira API, thi si the url to use to see if your api inatalltion is working ok. Please remember that to use the Sandbox, every other api paranmeters remain the same except the POST url.